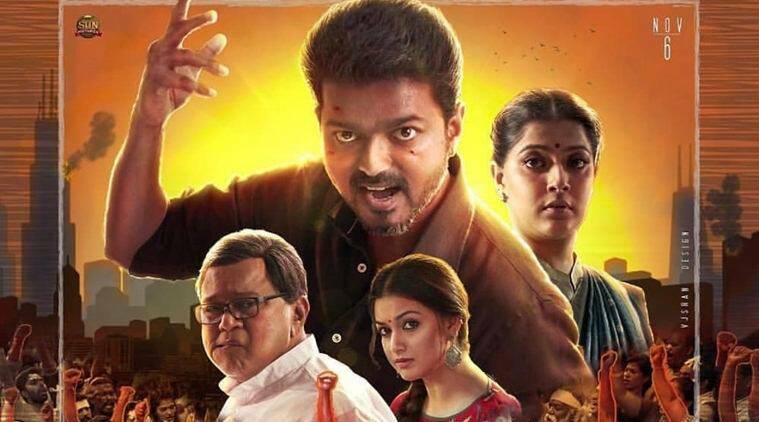 Sarkar leak: The Tamil Film Producers Council on Monday informed the exhibitors of Vijay starrer Sarkar that a portal that "hosts pirated versions" of films has said that it would upload the HD version of the movie. Sarkar hits the theaters on Tuesday. The Tamil Film Producers Council on Monday informed the exhibitors of Vijay starrer Sarkar that a portal that “hosts pirated versions” of films has said that it would upload the HD version of the movie as early as Tuesday evening within hours of its release. The cautionary message came after a tweet surfaced on the Twitter handle of the website Tamilrockers. “#Sarkar HD Print Coming,” read the tweet. The Tamil Film Producers Council (TFPC) said the portal must not succeed in its illegal attempt and urged movie halls to deploy personnel inside theaters to prevent recording of the movie by using mobile phones or cameras. Last month, Vijay had said corruption has spread like a “virus” in society and insisted if the leader at the top is honest, so will be his followers. He also said that bribes were demanded even for issuing birth and death certificates. In Sarkar, the actor plays the role of a highly-successful CEO who takes over the failing political system of the state and turns the fortune around. “I am a corporate criminal,” says Vijay in the teaser. Sarkar also stars Keerthy Suresh, Varalaxmi Sarathkumar and Yogi Babu among others. The film is the biggest Diwali release down south and is expected to set new collection records from the opening day itself. Besides Sarkar, comparatively small budget movies Billa Pandi and Kalavani Mappillai are being released on the festival of lights.